National Rail Enquiries, the UK’s number one travel website, is proud to release the must-have app for every train traveller. 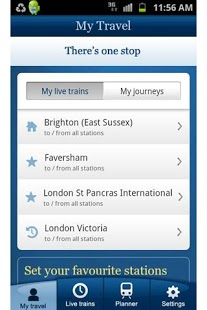 Now you can access detailed, real-time train information direct from your smartphone. So much more than a timetable, innovative technology enables you to track specific trains, find out about disruptions to your journey, and re-plan your journey on the go. 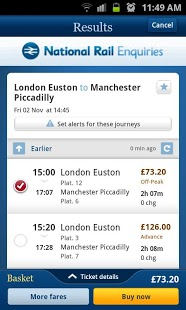 With unprecedented visibility and intuitive tools, the National Rail Enquiries app will transform your train travel experience, empowering you to catch the right train and complete your journey. – Can you take your bicycle on your journey? Are reservations required? How many bicycle spaces are there? 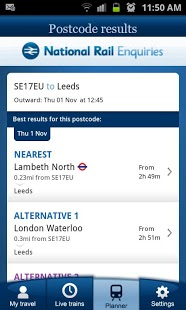 Enhance your train travel experience – download the FREE National Rail Enquiries app today. – It is now possible to add planned journey details to your calendar as events. To allow this the app’s permissions regarding calendar events have been updated.